Naha — the capital city of Okinawa — is a relatively small place. I know this because I accidentally walked about half of it during my last trip to Okinawa! We took the tiny little monorail that winds through the city, all the way up to the Shuri Castle, which is the last stop on the monorail line. But we weren’t going to visit the castle itself, having done that on a previous trip. 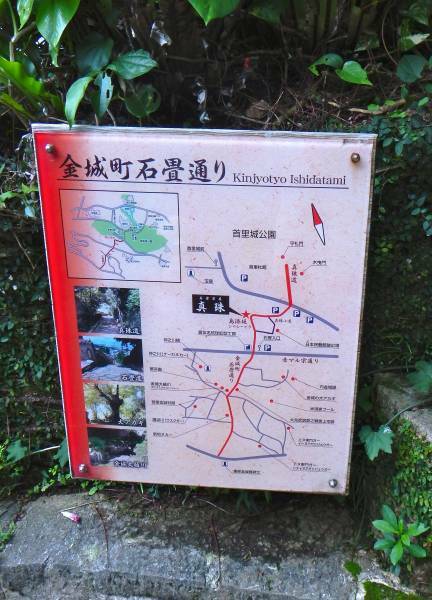 This time we were just going to walk down an old part of Shuri town called Shurikinjocho (though this sign at Shuri spells it as Kinjyotyo Ishidatami), a meandering stone path that winds down from Shuri Castle through small traditional neighbourhoods. We weren’t quite sure where we were going and didn’t have a map, but managed to find it nonetheless (from Shuri monorail station, just keep following the left-hand side of the castle grounds, and you’ll run into the entrance to the stone path). Like I said, it’s a stone path. So obviously you need good shoes. If you’re wearing heels, forget about it. 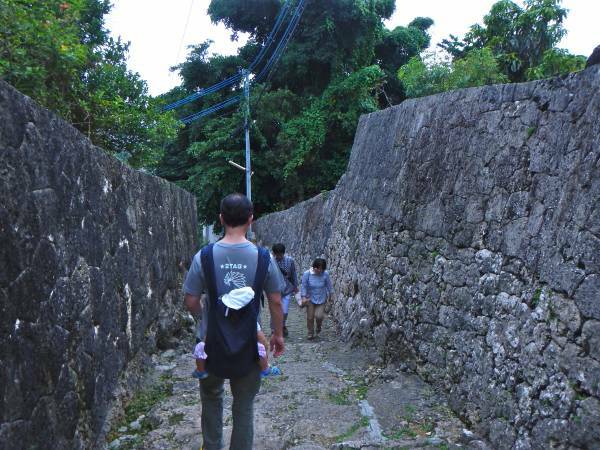 What is cool is that it goes through really high stone walls dating back from the Ryukyu Kingdom, when the royal family lived in Shuri Castle, long before Japan annexed Okinawa as a territory. 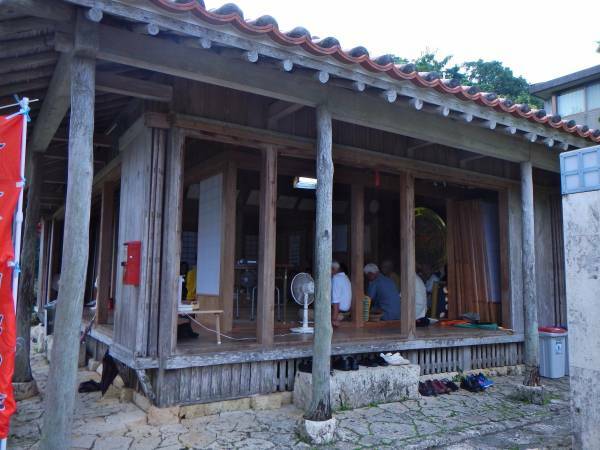 And there is some lovely traditional Okinawan architecture in the area. After we finished walking the entire stone road, we came out onto a main road that thankfully had a Family Mart a few steps away, so we popped in there to down a few cold ones and have a convenience store snack. From there we ambled on a bit, stopped to ask for directions back to the monorail, and much to our dismay were told ‘zuuuuuuuuto, massugu’ which means waaaaaaaay down the road. Damn. So we went, got a bit lost again, and kept going for what was a little more than an hour, until the residential areas began to turn into what seemed to be the typical businesses that you find close to a train station. Much to our surprise, we ended up all the way in Asato! We were only two stops away from our hotel, in Miebashi, which means we’d walked a little less than half of the entire monorail line. Anyway, if you want to go to Shurikinjocho, it is a lovely walk, but be aware that once you get all the way down, you can either do what we did and foot it all the way to Asato station, or turn around and go back to Shuri Castle and to Shuri Station. Unfortunately the end of the path drops you off in the middle of nowhere! So fun to follow your excursions.